The 2018 Scarborough Renaissance Festival® features over a dozen new stage and lane shows, a new Royal court, and new artisans with their artistic creations. The 38th season of the festival kicks off April 7 and runs through May 28. 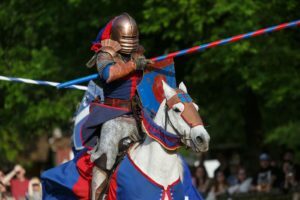 Enjoy full combat armored jousting, Birds of Prey exhibitions, a Mermaid Lagoon, living chess matches, Knighting ceremonies, and much more at the family-friendly festival. There will be 27 stages of interactive entertainment, unique crafts at 200+ shops, artisan demonstrations, Renaissance rides and games of skill. The season begins with The Time Traveler’s Weekend April 7 & 8. The weekend includes Time Traveler’s costume contests for the adults and a “travel through Scarborough” scavenger hunt for the kids. It will also be our “Kids Free Weekend” when up to three children (ages 5-12) are admitted free with each paid adult. Children 4 and under are always free. Seniors 65+ get a special discount this weekend as well with half price tickets at the gate. Guest performers opening weekend include the London Broil Show and Ky Hote. Guest Artisans are Painted by U, Storm Leather Werks and SWS Cutlery. Each successive weekend has a different theme including the Artisan’s Showcase, Royal Ale Festival, Celtic, Mother’s Day, Chivalry and Live the Fantasy celebrations each with a variety of special events. Scarborough Renaissance Festival® offers “Food Fit for a King” that is a step above food offered at most North Texas Festivals and events. Visitors can feast on giant roasted turkey legs, the largest food-on-a-stick selection in Texas, Scottish Eggs or try some of the daily special creations at Pasta Palace and Scarborough Bakery. The full service restaurant & bar, the Rose & Crown Inn, offers a sit down dining experience with daily specials and signature items like Shepherd’s Pie, Bangers & Mash, meat pies and Muffalettas. Visitors 21 and over can partake in our custom blended Scarborough Mead, beer, wine and other adult beverages at one of the 12 pubs and taverns. There are also daily wine and beer tasting events for those with a more discerning palate. Tastings require a separate ticket that can be purchased in advance or at the Festival (on festival days). Seating is limited and the tasting events regularly sell out so it is recommended that you purchase your tickets in advance. The year in which the Festival is set has changed to 1521 at the beginning of the reign of King Henry VIII during his marriage to Catherine of Aragon. The 150+ members of the Scarborough Academy of Performing Arts (SAPA) bring this period to life with their outstanding portrayals of these historical figures and other period characterizations. 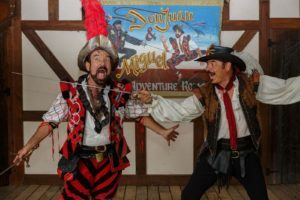 • A number of fan favorites will be performing on new stages/locations at this year’s Festival including Don Juan & Miguel, Zilch the Tory Steller, The Fire Whip Show, Nature of Mercy, Cale the Juggler and several others. 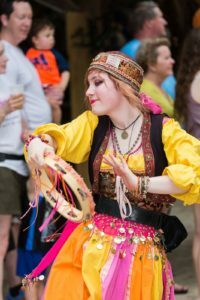 • Scarborough Renaissance Festival® is family friendly with many performances and activities for kids such as the Children’s Knighting Ceremony, Living Chess Match, the Mermaid Lagoon, Fae Follies, Nature of Mercy, Tales from the Village, Renaissance Rides, games of skill and much more! • Some performances are geared toward a more mature audience (16+). They include: Arthur Greenleaf Holmes the Wildly Inappropriate Poet, Christophe the Insultor, Iris & Rose – Wild and Thorny and the King’s Pub – Pub Sing. • The Flying Freak Show – Sir Real the Puppet Man brings puppets, comedy and audience participation to the stage. It’s silly but smart, weird & wonderful! • The Spindleshanks – fantastical creatures and tall friendly folk striding through the village embodying the folklore of Scarborough! • Wolgemut – (vol-guh-moot) meaning to “be in a good mood”, this traditional German style bagpipe and percussion group present a high energy show with historical music on original instrument. The 2018 Scarborough Renaissance Festival® is open Saturdays, Sundays, and Memorial Day Monday, April 7 – May 28, 2018 from 10 AM to 7 PM. Located in Waxahachie, Texas, Scarborough Renaissance Festival® is just 30 minutes south of the Dallas/Fort Worth Metroplex on FM 66 off of I-35E at exit 399B. Admission is $28 for adults and $13 for children, ages 5-12. Children age 4 and under are admitted free. Parking is free compliments of Waxahachie Nissan. Tickets are available on-line and discount tickets can be purchased at Tom Thumb & Albertsons stores starting March 30th. A ‘$10 off 2 Tickets’ coupon can be found at North Texas MetroPCS stores from March 23th through April 29th (offer valid only through April 29th), and discount coupons can be found throughout the season at Waxahachie Nissan. Sponsored by Dr Pepper. Tom Thumb & Albertsons are proud to continue our long-standing partnership and support of Scarborough Renaissance Festival’s 2018 season. MetroPCS As America’s Un-carrier, T-Mobile US, Inc is redefining the way consumers and businesses buy wireless services through leading product and service innovation. The Company’s advanced nationwide 4G LTE network delivers outstanding wireless experiences to more than 63 million customers who are unwilling to compromise on quality and value. Based in Bellevue, Washington, T-Mobile US provides services through its subsidiaries and operates its flagship brands, T-Mobile and MetroPCS. Waxahachie Nissan is the proud automotive partner for Scarborough Renaissance Festival® 2018. Waxahachie Nissan has the best Nissan deals anywhere. We don’t sell you a Nissan we help you buy one!